Jai Ho is now closed and another restaurant is in it’s place. “Top class surroundings and fantastic curry” promises the latest and greatest on South Shields’ famous Ocean Road, which has also been picking up a few awards in the short time that they have been open. Now, we’ve been up and down the famous Ocean Road and tried many, many curries, and while there may be some good value food on offer, it’s all a bit of a world away from the Newcastle “Big 3” of Vujon, Sachins, and Raval. 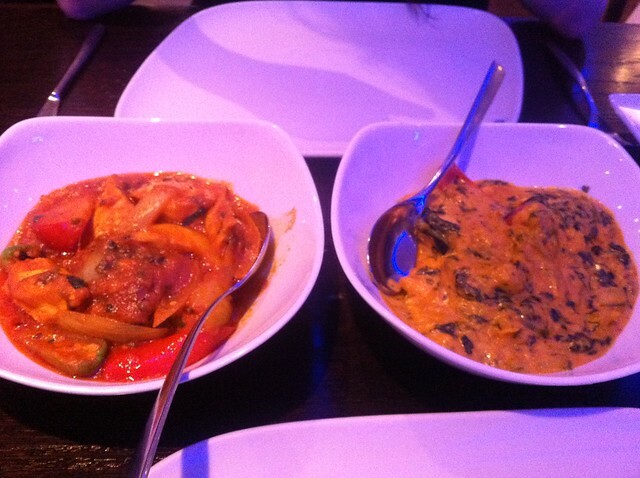 They popped up on a Groupon deal recently – so we went South to see if Jai Ho could live up to its growing reputation. We managed to get a table early on a busy Saturday night, and it’s immediately obvious that Jai Ho (NE33 2JF) is trying to distance itself from it’s neighbours. The menu offers truly modern Indian cooking as well as “old-school classics”, and while they do have special set menus, they don’t follow the others with really old fashioned choices such as charging extra for chicken breast (which is crazy). The interior is modern and light, if a little BLUE (you’ll have to see it to understand), but clean and spacious. Staff are attentive and give more than the usual grumble you expect from Ocean Road – all good signs, and at least we are in the 21st century, not bored in the ancient interiors you see up and down this street. Giggling at photos of recent visitors Joe McElderry and David Milliband, then seated, we get the obligatory poppadums and pickle tray (£4, pictured), which has some good pickles on – or at least, they don’t look like Patak’s classics – a good start. 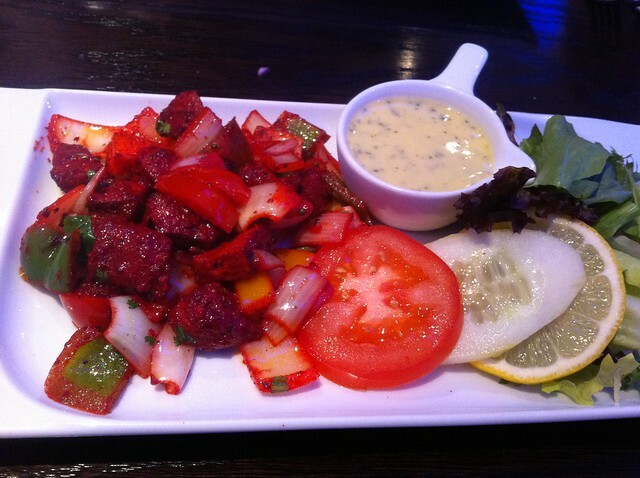 While we could possibly sit all night and scoff poppadums, our menu offers us a good selection of starters – both modern, and “old-school”. 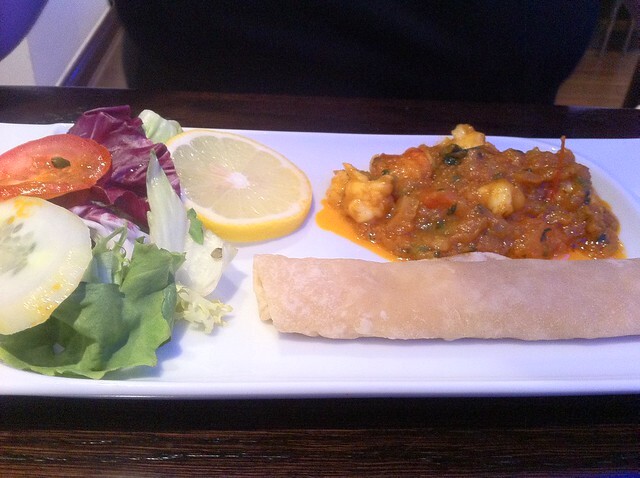 My partner chooses a classic bhuna prawn on puree (£3.95, pictured), while I opt for my go-to choice of tandoori lamb from the modern menu, a boti kebab (£4.75, pictured). They quickly arrive scalding hot, and look good. Prawns are large and juicy, and the amount of lamb could have easily floored me, if I didn’t love it so much! The tandoori flavour is smoky and moreish, and with crunchy onions and cooling raita, what’s not to love? 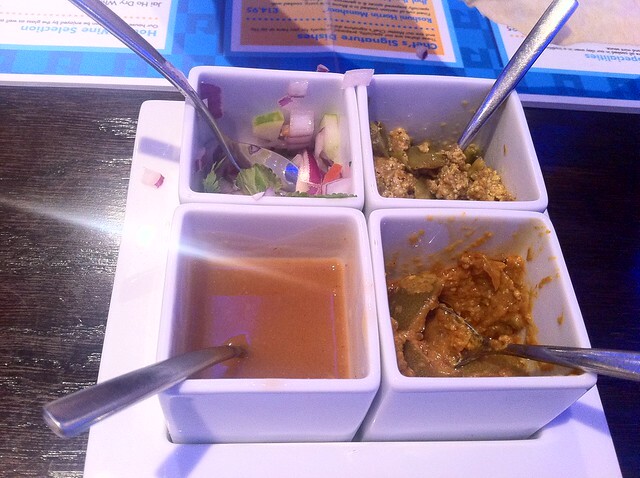 The puree doesn’t go soggy, although the accompanying salads are, as ever, an unappetising afterthought. Interestingly they have crab meat, and even venison on the menu here, something you won’t see in too many of Jai Ho’s competitors. Mains courses – we take on hariali (£8.45, pictured right) and sabka maza (£10.95, pictured left).They kindly let us swap out an extra pilau rice included in the deal for a garlic naan bread – both of which are good, not world changing. Sabka Maza is a “highly recommended chef’s signature dish” and while first impressions are a mishmash of veg in a light tomato sauce – first taste reveals a fiery complex flavour that doesn’t disappoint. Meat is a hit in both dishes; huge, soft and plentiful. The hariali comes out a little less spinach-y and a little more creamy than expected, but is tasty all the same. Definitely a good pair of unusual, somewhat different, curries, though if I had to criticise, the sabka maza is a tad overcooked, and the vegetables inside are starting to mush a little bit. Portion sizes are just enough. The deal also included two pints of Kingfisher beer – and Cobra etc. are all well represented, though there is also a quite extensive wine list, for these parts at least. Good to see. Toilets are also not embarrassingly old-fashioned – far too common a sight in restaurants like this. Easily the best Indian on Ocean Road, skip the rest and head for Jai Ho; but perhaps only for a prix fixe menu – at a la carte prices, it’s worth a visit, but you might be better off dining in Newcastle. Step up your game, rest of Ocean Road! All information correct as of 18/10/2011.